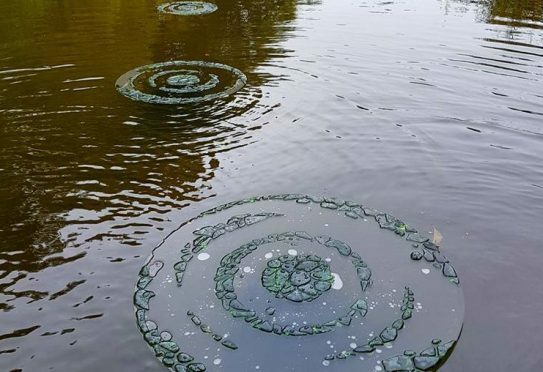 Shelagh Swanson's 'Ghost Ripples' has been created using Champagne bottles found on the estate. Nature lovers, who take a stroll around Haddo House this week, are being encouraged to contemplate the meaning of life with the arrival of new art installations around the estate’s circular route. As part of this year’s Haddo Arts Festival, current and former students of Gray’s School of Art have created 17 pieces throughout the country park, based near Tarves, entitled ‘Dawn to Dusk’. The project has been inspired by Israeli poet, Yehuda Amichai, whose poem ‘Like our bodies imprint’ is also featured within the trail, and its aim is to explore “Nature, Art and Humanity”. Haddo Arts spokeswoman, Cathy Guthrie, explained the initiative was designed to make people mindful of the transience of life. She said: “The works explore the impact of humanity on the landscape and also the impact of the landscape on our humanity. Third year art student, Martin Bell’s work ‘Apparently I was here’ signifies the life span of a human as an uneven line of sand down the main avenue on the estate. The works have been created from an array of materials, gathered from across the Country Park and elsewhere in Aberdeenshire. They will be allowed to decay back into the landscape as part of the exhibition.